One of the most widespread arguments about the Eurozone crisis is that countries such as Greece, Spain and Italy have been hamstrung by their lack of monetary sovereignty and the ability to devalue their own currency. Deborah Mabbett and Waltraud Schelkle assess this perspective by comparing the experiences of Greece with Hungary, which does not use the euro, and Latvia, which previously pegged its currency to the euro before joining the single currency in 2014. They find that while there are real problems with the crisis management in the Euro area, monetary sovereignty is not the solution. It’s all quiet on the euro front at present. We would not be so reckless as to predict that this will last, but this pause gives us a chance to reflect on the lessons so far. During the crisis, we learned about the importance of monetary sovereignty, a notion that had become somewhat discredited in the 1980s and 1990s. 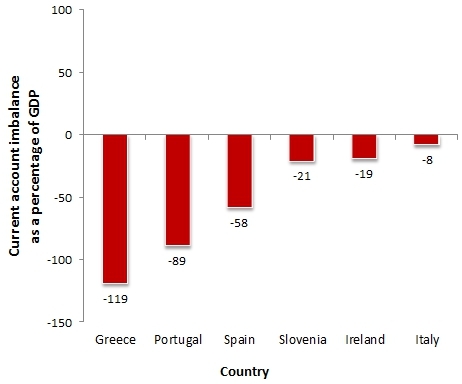 We learned that the ‘GIPSI’ group of states (Greece, Ireland, Portugal, Spain and Italy) suffered because they could no longer adjust their nominal exchange rate, and so were fated to experience a secular decline in competitiveness. And we also learned that a central bank should act not only as lender of last resort to the banking system, but also to the government: monetary sovereignty is valuable because it means that the central bank can buy government debt by printing domestic currency. Somewhat surprisingly, we learned this from economists such as Paul De Grauwe and Paul Krugman, whose work had contributed to the discrediting of monetary sovereignty before the crisis. Paul Krugman founded a literature on speculative currency attacks which showed that the exchange rate would not stabilise the economy in a world with free capital movement; instead, currencies were liable to overshoot the values that would produce stability. Paul De Grauwe made his name as a critic of the theory of optimal currency areas, showing that it overestimated the usefulness of the exchange rate as an adjustment mechanism. Recently, however, they have returned to the praise of monetary sovereignty. Paul Krugman applauds, for instance, that Britain stayed out of the Eurozone, based on a ‘real economic framework– optimum currency area theory’. Paul De Grauwe has illustrated his idea that the Eurozone crisis is self-fulfilling with the comparison of Spain and the UK: Spain rather than the UK is in trouble because it has lost control over its own currency. What has happened to all the empirical and theoretical objections to the exchange rate as an adjustment mechanism? Was the prime motive for entering the monetary union, namely to escape the self-fulfilling panics of financial markets, a mere folly of Europhile elites? We looked into this in a recent paper (forthcoming in the Review of International Political Economy) where we compared the experience of Hungary and Latvia with that of Greece. All three countries were recipients of external assistance in the crisis, but Hungary and Latvia seem to be more or less out of the woods (apart from damage self-inflicted by Hungary’s nationalist government) while Greece is still in depression. 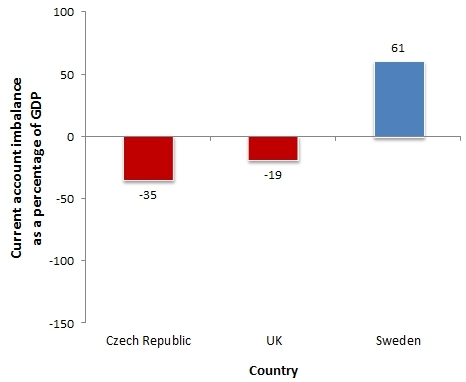 We asked two main questions: did Hungary benefit from being able to devalue? 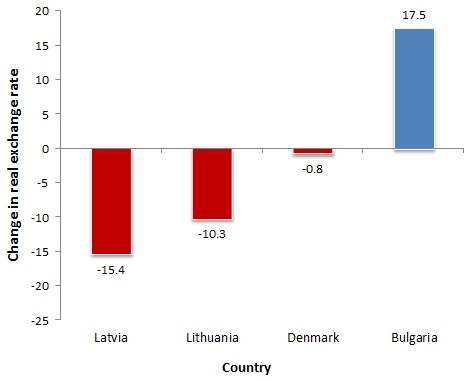 And why did Latvia recover faster than Greece, despite maintaining a fixed peg to the euro? We found that membership of the Euro area did make a difference, but not in the ways that proponents of monetary sovereignty claim. Our first relevant observation is that, before the crisis, extreme financial imbalances affected countries outside as well as inside the Euro area. It is not correct to claim that the Euro area allowed current account imbalances to go unheeded; they were unheeded outside the common currency area too. 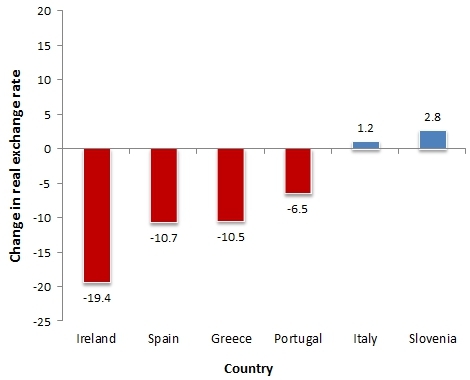 Chart 1 shows the accumulated deficits of countries grouped according to their exchange rate regimes. 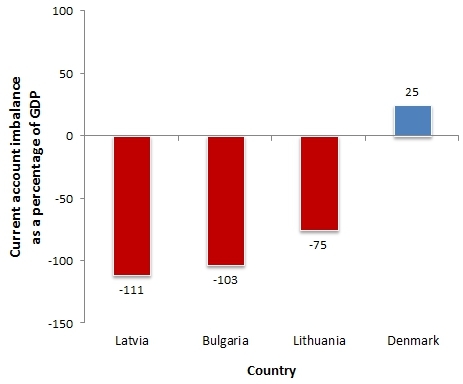 Greece takes the prize for the largest accumulated deficit, but only just, from Latvia and Bulgaria. It is clear that the financial markets were ready to lend regardless of euro membership or currency regime. The second observation is that both Hungary and Latvia got into trouble almost a year before Greece. During this period when financial markets froze, it seemed to be a blessing to be inside the monetary union, protected by the supply of liquidity by the ECB. But it was a mixed blessing: Greece’s problems deepened because external investors could unwind their positions. When Hungary and Latvia sought external assistance, the lenders (led by the IMF) cajoled foreign banks into burden-sharing under the framework of the Vienna initiative, and the outflow of private capital slowed. We found that the Euro area is an area of extreme capital mobility, in which the liquidity supplied to the banking system suppresses warnings of trouble to come. Third, we found little support for the proposition that a flexible exchange rate is a useful policy instrument. As Chart 2 shows, the existence of an exchange rate makes surprisingly little difference to the extent of real devaluation. This is not to say that it is easy or even preferable to achieve real devaluation by other means (basically, internal contraction) but it is hard to sustain the argument that only nominal devaluations succeed. 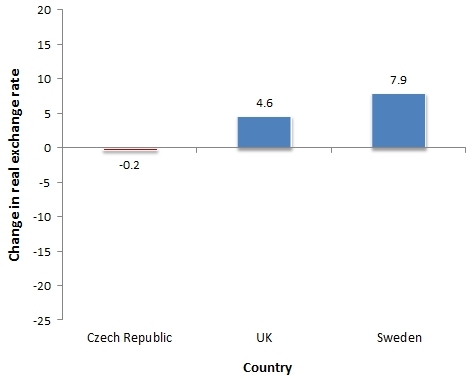 Furthermore, advocates of nominal devaluation may underestimate the real costs imposed on actors in the domestic economy: a particularly salient issue in Hungary and Latvia, where many households and firms had taken out foreign currency-denominated loans. Note: The charts show the change in real exchange rate for the countries in the same four categories contained in Chart 1. Note that there is a difference between the nominal exchange rate (the formally stated rate at which a currency can be exchanged for another) and the real exchange rate, which reflects the value at which goods and services within one country can be exchanged for those in another. Source: DG Ecfin quarterly competitiveness report, REER based on unit labour costs (total economy). Surely, though, there is support for a fourth proposition, that a country that has monetary sovereignty can solve its problems by borrowing from its own central bank? Well, no: Hungary and Latvia (and innumerable other sovereign states) have had to turn to external lenders for assistance. What stops them printing money is the prospect of catastrophic currency depreciation and capital flight. The constraint that appears as a financial market crisis for members of a monetary union appears as a currency crisis for countries with their own central banks. The choice of comparator countries does matter here. The UK has done nicely out of its monetary sovereignty, with the Bank of England now holding about £375 billion in gilts – 25-30 per cent of the debt stock, depending on how you measure it. But it has been able to do this without inducing a deep slide in sterling only because of the fortuitous fact that sterling remains a reserve currency. Sterling could have lost that status, but it was aided by the problems affecting other reserve currencies, including the dollar and the euro. No doubt Hungary’s nationalist government would like to exercise monetary sovereignty and sell bonds cheaply to the central bank, but the forint is not a reserve currency. To finance the government in the crisis, the IMF and EU lent funds to the Hungarian central bank, which the government debt management agency drew on to purchase debt. In turn, the central bank sterilised the increase in the domestic money supply by issuing central bank bills. The IMF was quite open about the fact that it had engineered a monetisation of government debt but without expansion of the domestic money supply: government bonds held by non-residents were largely replaced by central bank bills held by domestic banks. But this could not have been done without a foreign exchange loan. We don’t deny that there are particular problems with the monetary financing of government debt in the Euro area. In Greece, the banks hold a huge share of Greek debt, and this indirect channel of financing has created a ‘diabolic loop’ whereby a sovereign debt write-down will render the banks insolvent, while bank recapitalisation deepens the sovereign’s indebtedness. The diabolic loop can be traced to the Euro area’s prohibition on direct monetary financing of sovereigns, combined with the easy access to ECB funds enjoyed by banks. This is a major problem in the euro monetary system, and banking union is needed to address it and break the loop. But it is a big step to go from acknowledging this problem to singing the praises of monetary sovereignty. Our comparison of Hungary, Latvia and Greece showed not the benefits of sovereignty, but that countries outside the Euro area got more constructive external assistance than those inside. Why so? We think because the world has learned how to prevent self-fulfilling currency crises, not least from the writings of De Grauwe, Krugman and many others. The IMF’s botched intervention in the 1998 Asian crisis has also helped to concentrate minds, namely that shrinking public finances is not the appropriate response to all macroeconomic instability. The lesson to be learned now for tackling the Eurozone crisis is not so different: cooperative institutions are required to manage interdependence within a monetary union. But there is no return to monetary sovereignty for the GIPSIs; they did not have it before they entered the Euro area and will not get it should they leave. Deborah Mabbett is Professor of Public Policy at Birkbeck, University of London. Her research interests include the political economy of social security, the regulation of insurance and financial markets, as well as social policy dimensions of the financial crisis. Waltraud Schelkle is Associate Professor of Political Economy at the European Institute of the London School of Economics. She is particularly interested in the political economy of European monetary integration and the role of social policy for financial markets. A Monetarily Sovereign government has the unlimited ability to pay any debts denominated in its own currency — without the need for taxing or borrowing or any other form of income. The U.S., for instance, could pay for Social Security and Medicare without FICA, simply by sending instructions to beneficiary’s banks to increase the numbers in their checking accounts. By contrast, monetarily non-sovereign governments –cities, counties, states, euro nations — require income, in the form of taxes or payments from a central government. The U.S. (and the world) went off the gold standard, because the restrictions of gold prevented them from stimulating their economies. The euro essentially is a kind of gold standard. It restricts nations from growing their economies. 2. Financial consolidation via a United States of Europe, in which the EU gives (not lends) euros to member nations as needed. There are no other solutions.